Some Bengali vegetable fries related to ritual and faith. The Bengali’s obsession with bhog offer to the Goddess (Devi Durga, Lakshmi, Sarwasati ...) is remarkable. Apart from fruits and sweets most homes or pandals prepare anna-bhog, which usually consists of Khichuri ( an item consisting of gobindobhog rice and yellow moong dal) with a collection of different kind of vegetables (usually five in number), which is considered to be a good omen. 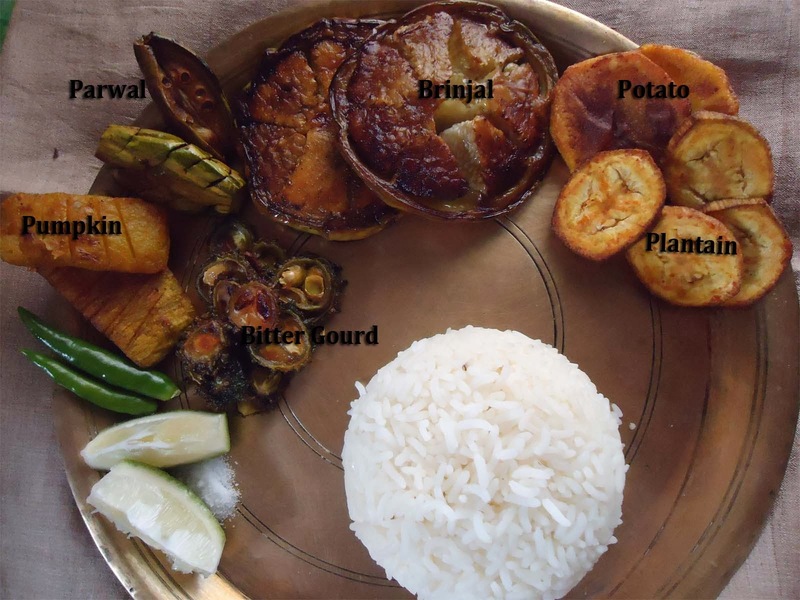 In Ai buro bhaat (pre-marriage feast) and in Shaadh (desire) - a ritual similar to a ‘baby shower’ which is not particularly a religious practice but is a part of the traditional Bengali culture. 'last meal' that is eaten by the bride/groom before the marriage and the meal served to an expecting mother consists of different types of traditional dishes, in which Dal or lentil is served with five kinds of bhaja or fried vegetables (potato, aubergine, bitter gourd, parwal, pumpkin – ritually consisted with five different kinds of vegetables) and some dishes consisting of fried edible leaves. Griha Pravesh or house warming ceremony - in this expression of joy traditionally the meal is based on rice. Some Bengali families would prefer vegetarian items because of the satyanarayana puja which is performed before this puja while some others would like to be more liberal like some of these banqueting culture ceremonies. What comes with the feasts is some delightful vegetable preparations consisting of a classic mish-mash of vegetables, slow-cooked in some extra spoonful of oil, one can say boiled and cooked in oil – a dish called chhenchra (mixed vegetables with fish bones). In Annaprasan (first solid food eating ceremony), Upanayana (sacred-thread Ceremony), Shraadh the ritual of ancestors feeding on the living what comes with vegetarian preparation is an assortment of fried vegetables (brinjal, potatoes, bitter gourd and pumpkin rolled in batter). Cut pumpkin in a thin slice and other vegetables in round shape. Mix salt and turmeric and additionally a little oil to brinjal it will not absorb much oil then while frying. Keep all aside on a colander for 5 minutes to discard extra water from the vegetables. Deep fry all vegetables one at a time in hot oil (preferably mustard oil for extra burst of flavor of Bengali cuisine). Adjust the temperature, fry without burning them, allow to cook for about 4 to 5 minutes or until crisp. Drain on paper towels.